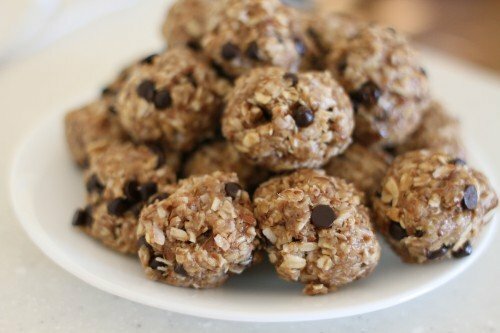 The Best No Bake Lactation Bites - I Can Teach My Child! As a nursing mother, there are two things that I desperately need: enough milk to feed my baby and enough energy to take care of all three kiddos. This recipe kills two birds with one delicious stone! These “booby bites” (which my husband hilariously coined) will help boost lactation while providing lots of protein and vitamins as well…and did I mention they are delicious? I recently read that the combination of oatmeal, flaxseed, and Brewer’s Yeast can help boost a nursing mother’s milk supply. I have seen recipes for “lactation cookies” around the web that include these ingredients in a delicious treat. However, I also read that the benefits of Brewer’s Yeast (including the vitamins) can be decreased through the cooking process. So instead of making cookies that must be baked in the oven, I decided to make some energy bites (modified from this recipe). Since Brewer’s Yeast is a good source of Vitamin B, this would be a great treat for the whole family…not just for a nursing mom! 1. 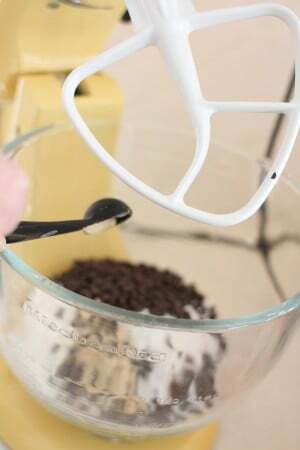 Combine the dry ingredients first: oatmeal, coconut, chocolate chips, Brewer’s Yeast, and flax seed. 2. Add the peanut butter, honey, and vanilla and turn your mixer on low (or stir together). 3. Refrigerate mixture for at least one hour. 4. Remove from the refrigerator and roll the mixture into small balls. **Please note: Brewer’s Yeast is safe for most people, but please consult your doctor prior to including it in your diet. You can find more information about it here. The content in this post is for informational purposes only. The content is not intended to be a substitute for professional medical advice, diagnosis, or treatment. Always seek the advice of your physician or other qualified health provider with any questions you may have regarding a medical condition. Never disregard professional medical advice or delay in seeking it because of something you have read on this site. Did I miss the announcement? Is baby girl here already? These look yummy and I’ll be nursing again soon as my 5th is due in June. Thanks for sharing. These look great! Would they turn out ok without the brewers yeast? I love the addition of oats. I will have to try that, especially if God blesses us with another child in the future. I was wondering the same thing….has the new baby arrived? Great way to turn these into something for nursing moms! We tried a similar recipe last week (without the mommy friendly ingredients) and tried to turn them into cute little animal shaped snacks for kiddos. These snacks looks devine! Will definitely try them. Just one question: how should they be stored – airtight container in the fridge? How many should you eat a day? Depending on the size you make them, probably 2-3 since they are relatively high in calories (thanks to the PB and honey). What is the nutritional and caloric value in these? I know you posted this forever ago, but I used sliced almonds instead of coconut. Worked great! Im just not a coconut fan. This is great – thanks! 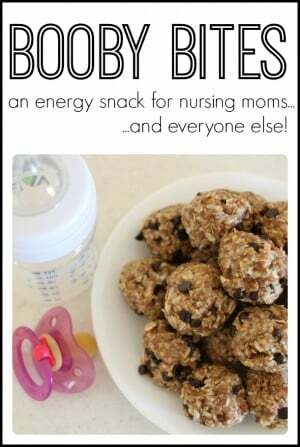 Pinning for when I start breastfeeding again because I am always so hungry! Is the shredded coconut sweetened or unsweetened? Or doesn’t it matter? Thanks :) I’m hoping these help with breastfeeding second time around. Hi Amanda! You can use either. Obviously, I prefer the sweetened coconut because it is sweet! :) But unsweetened would still give you the same consistency with fewer calories, making it a little healthier. Unsweetened! These bites are super sweet already. Next time I make them I’m going to cut the honey in half and substitute more peanut butter. I have a huge sweet tooth so that’s saying something. I made these for my daughter who was having some trouble keeping her milk supply up when she went back to work. She was pumping daily but it was just not as rich as before. A few days of these and her milk was back to normal. Her friends have been clamoring for the recipe and after trying them, everyone noticed a definite increase in milk. Plus the little grand daughter who is a tiny thing, loves them for a snack and they are so nutritious! I’d like to make these in a big batch and freeze them. Do you think they’d hold up? They are great frozen!! I always make a double bath and freeze some! Yes, they are delicious frozen! Hi, I am super interested in trying this recipe, although I am wondering If I wanted to make these for a friend and ship to her how do you suggest I prepare and contain them to be shipped? Do you think they will stay together or good? Do you have any suggestions ? Hmmm…I think they should probably stay together well because the honey keeps them stuck together. You could freeze them ahead of time? How long do these stay good in the fridge? I would say up to a week, just to be safe. :) You can freeze them for much longer, though! What can a substitute for peanut butter? Great Blog! Any nut butter or Sun butter would work in place of the peanut butter. You might try Sun Butter. I just made these (they’re chilling in the fridge now) and they are delicious! I added a little cinnamon and about half a cup of craisins to mine. Those additions sound yummy! So glad you like them! I shared this on my blog because they were so fantastic! Thanks for the recipe. Yum! Do you have to use Brewer’s yeast or will any yeast do? You can leave it out if you don’t like coconut. The balls might not stick together quite as well, but you could always add something else? These are very good! Thanks for the recipe. So glad you like them! Thanks Amanda! 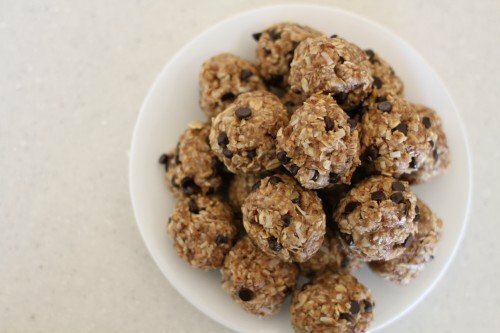 I too make lactation cookies to help boost my breastfeeding but have never found or tried a no bake recipe before. I use oatmeal, sprouted ground flaxseed and brewers yeast in my recipes. What are your recommendations for storage? Cookie container on counter or keep them in the fridge? If I don’t want to use chocolate chips, do I need to change any of the ratios wet ingredients? Can you tell me how long you can store the booby bites for? Can you freeze them etc? I would guess they would last at least a week if refrigerated and probably longer if frozen. I just made these and am super excited to try them! How many would you suggest eating a day to help increase production? It’s been quite a while since I made them, so I can’t say for certain. I think I might mention it in the post (regarding the calorie content). Sorry I’m not more help! FYI – because you do not mention this in the recipe, but you should not use quick cook oats. Something in the process for quick cook oats diminishes the quality that boosts lactation. You should use real oats or steel cut oats. 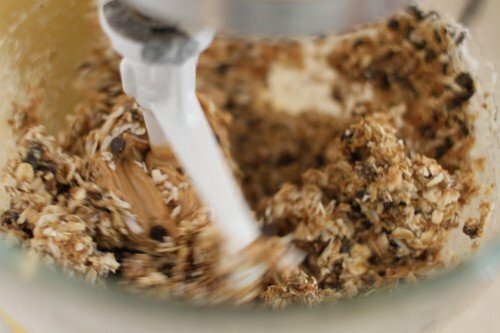 I realize this blog post is old, but I saw someone post the link to it on another forum and while I love the idea of no bake treats to boost milk production, just want to make sure everyone is using the correct form of oats. Can’t wait to make these for myself. Yum yum. Do you need to use coconut? Thank you for posting these! I’m not nursing but I found my energy was quickly lifted with one of these, so I think I’ll be making them for myself regardless! Do you know the nutrition facts for these? I made this recipe exactly as it says. They are delicious, however I do not really care for coconut but you really can’t tell too much that it is in there. However all I want to know is, does the coconut have anything to do with lactation if I omit it? Also maybe raisins could be added?? Not sure that the tiny amount of Brewers yeast in this is enough to make a difference. I use 6 tablespoons in mine, and I use half a tablespoon in each serving of oatmeal that I eat. You need more! It can be a little bitter but the honey and peanut butter act as a nice cover. Can Agave nectar be subbed for the honey? This recipe is great! I used crunchy peanut butter and heath toffee bites…. AMAZING! Gonna try white chocolate chips and crunchy peanut butter next time!!!! You could just leave the coconut out all together and add a bit more of the oatmeal? This is such a simple recipe and I’ve now made it at least 5 times! I have 2 kids (one a year and a half, the other 3 months) and with being a stay at home mom it couldn’t get any easier! Especially with the hour break for refrigeration! LOVE these! Is there anything I can substitute the Peanut Butter for? Can you taste it in the bites? Do these freeze well? I’m thinking they maybe wouldn’t freeze solid, but do you think keeping them in the freezer would hurt them? Yes, they freeze wonderfully! That is my preferred method of keeping them…I just pop a few out at a time and let them thaw for a few minutes before eating them. I could eat these all day!! :) Not too sure if it’s going to help with my supply yet, as I just ate 4 about an hour ago, but they tasted really good, which is really funny because I usually can’t stand Peanut Butter and Chocolate together!! I’m repulsed by Reese’s Peanut Butter Cups Lol. Do these need to be refrigerated afterwards? Not necessarily…but I think they are better cold. :) They get a little goopy unless they are cold. I would like to mix the dry ingredients together ahead of time and give the mix, with a recipe as a gift. 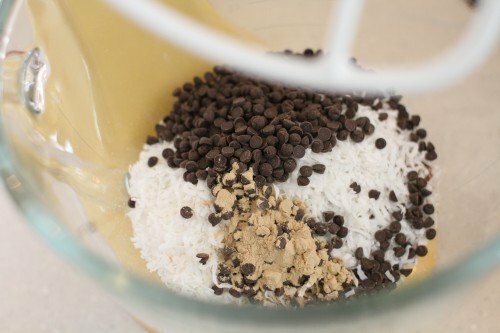 Would the dry ingredients hold up mixed together for a while? And can I use Steel Cut Oats? These look so yummy! These were so yummy! I ised almond butter instead and added sliced almonds in place of chocolate chips. They were so good, but too difficult to roll in balls. They just kept falling apart even after refrigerating them for a little longer. I ended up just comparing them into a container and cutting them in cubes. I wonder if a little extra honey would help hold them together? I want to try them with peanut butter and chocolate chips next time. Where do you get brewers yeast? I’m having trouble finding it. Thanks! I also doubled the Brewer’s Yeast. You don’t taste the bitterness with all the other flavors. 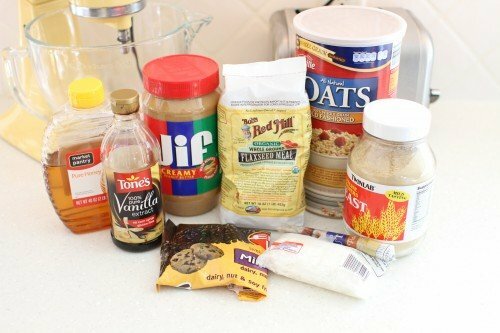 I just made these but I added some cookie butter in addition to the peanut butter and I left out the honey because Im not a fan. I’m just going to eat it by the spoonfuls instead of rolling it. Thanks! I have always wondered how to make these! Thanks for sharing ! Finally really appreciate thanks for sharing the value information !!!!! Where can you find Brewers Yeast? I have looked a couple of places but I am not sure if it is the right product. 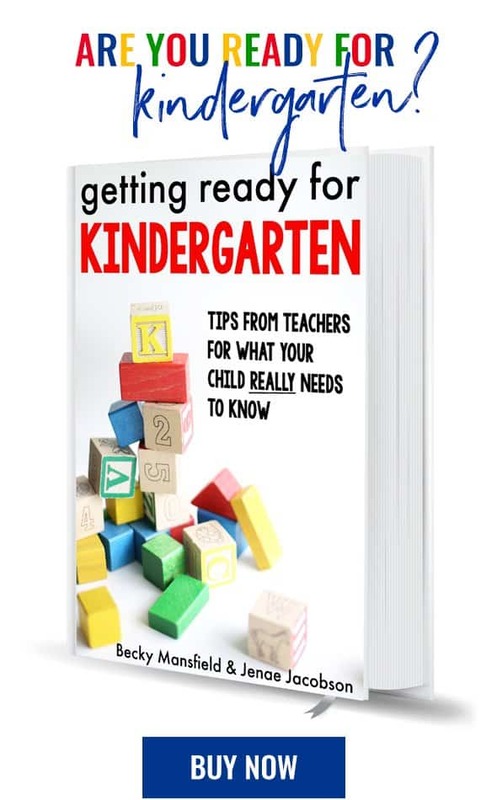 I bought mine on Amazon: http://amzn.to/2ppSUc4 Hope this helps! Love these ❤️ I hate coconut so I substituted for extra parts and added chia seeds, worked very well! I also added coconut oil and they were a little greasy but stayed together fine. My question is how long do they last in the fridge?? Extra OATS not extra PARTS LOL hate auto correct! These are delicious! I didn’t have coconut or chocolate chips, so I added cinnamon and some cocoa for taste and they turned out great!! Hoping to see more milk soon! Just made these sans brewer’s yeast and with sweet coconut. My sample tasted great! Can’t wait for them to be done chilling so I can eat more! I’ll definitely double the recipe next time. Could you sub the honey for maple syrup? Yum! I’ve made these before, but not with the yeast. I’m excited to add that ingredient. Thanks for sharing! Can anyone tell me what the calories and MAINLY the carbs are in these? I love love love them but I am watching my carbs!